Tricentric® valves resist wear and are suitable for aggressive media. 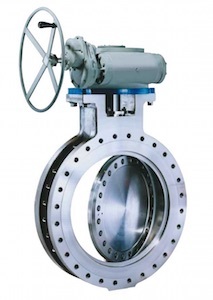 Valves are available in sizes 3" to 96" ASME pressure class 150 to 600. Tricentric® valves are suitable for a wide range of applications in most industries and offer exceptional value and performance. The compact size and shape combines light weight with the durability of a metal seal and seat. The triple eccentric design eliminates rubbing and wear with bi directional zero leakage. Tricentric® is available in standard and exotic materials for the most difficult applications. Electric Power Generation, Chemical Hydrocarbon process and industrial services. Pulp and Paper, Black Liquor, Lime Mud, etc.